Madeleine etc . : 10 - DÉC - Wikileaks - câbles diplom. 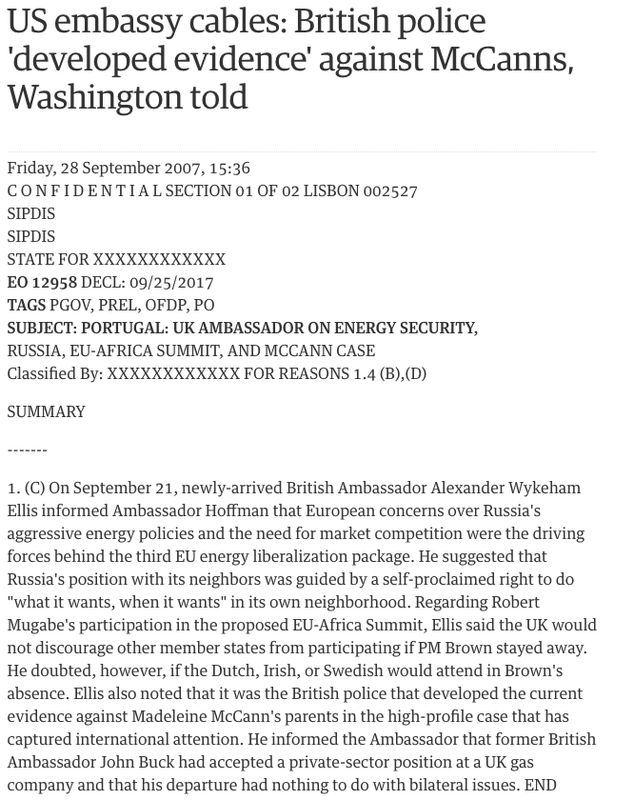 WikiLeaks website has published a summary of an alleged telegram exchanged between the USA and UK Ambassadors. This summary does not contain any new or relevant facts that will lead us to the discovery of what happened to our daughter. If the mentioned telegram does exist, its contents only tell that the British Police developed in September 2007 (we believe that to be the date of the correspondence exchange) information regarding our responsibility in the disappearance of our daughter. We recall that on that date the team coordinated by Gonçalo Amaral was still investigating the case, having produced a report incriminating both of us. That report was not supported by evidence that validated his allegations so due to the absence of any incriminating evidence about us, the case was filed after eight months of further investigation. Presumably, if any correspondence summarized by WikiLeaks does exist, it is based on the circumstances that arose in the investigation at that time, since we do not know that there has been any further investigation besides the one that we all know about – and in the process there isn't any information to the contrary. Once again, the ex-inspector Gonçalo Amaral has seized the opening given by the Portuguese media for his thesis, producing deeply hurtful insinuations and invocating the investigations defects. Defects on an investigation that he coordinated and didn't achieve any useful results for our daughter. These speculations are periodically brought to public opinion by that former employee of the PJ, accompanied by threats to reopen the case on his own initiative. When he claims publicly that he knows what needs to be done on the investigation and if "what needs to be done" is the investigation of facts, documents, data or real and concrete information that can lead to Madeleine's whereabouts, discovery or even the reason for her disappearance, he has the obligation to present it to the process to reopen the investigation, in which we are most interested. 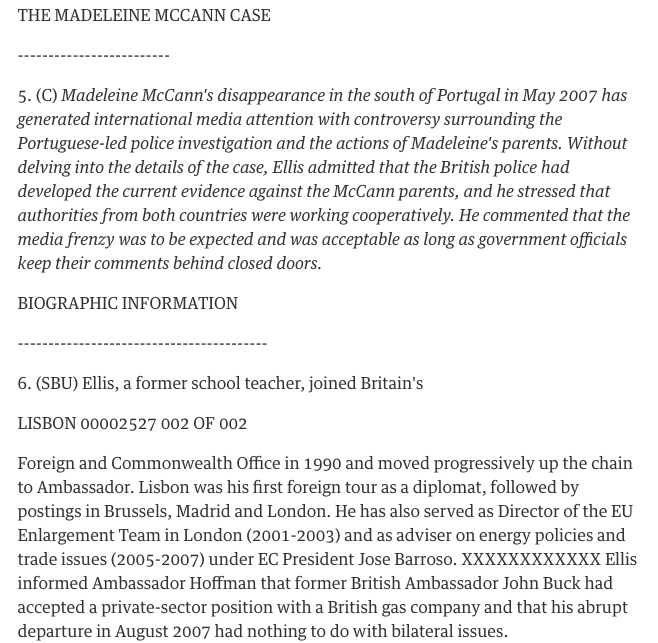 We are aware that Madeleine's disappearance is an inexhaustible source of enrichment to Gonçalo Amaral by means of false accusations, deeply offensive and harmful to the investigation itself, so we appeal to journalists' critical sense to disentangle what is journalistic information and what is speculation and a dubious means to an easy profit. Pedro Mourinho (P.M.) - Gonçalo Amaral, former inspector of the Judiciary Police, and author of the book "The Truth of the Lie" on the Maddie Case is with us, live, on the Midnight News. A very good evening to you Dr. Gonçalo Amaral. Gonçalo Amaral (G.A.) - Good evening. G.A. - No, in reality the only news is the document disclosure itself, since as for the evidence, the indicia, they are on the process. The cooperation and collaboration with the English police is public knowledge, and is on the process. The results are there, therefore there isn't anything new. P.M. - So, for you it isn't news that it was the British police that found the evidence that have, would have incriminated Madeleine's parents? G.A. - No, I didn't say that. It's not news as regarding to the evidence, now as to the proofs held by the British police I don't know what are they referencing to. There was a cooperation and collaboration, the evidence and indicia are in the process thus...I don't know, someone should say what the evidence are, perhaps someone from the British police should say it. All the same, it was a cooperation between the British and Portuguese police that has arrived to the proofs that are in the process. G.A. - He could only be referring to the evidence and indicia that are on the process. I'm not seeing any other, if there is other evidence, it would be strange for the British police to not have revealed them at the time. P.M. - The reference made in the last hours, Dr. Gonçalo Amaral, was in particular the evidence that had been obtained by the dogs brought from the UK, that were able to find cadaver scent in the McCann's car, could that be the evidence? G.A. - There are several indications. The information that are on the process results in other evidence, and, therefore there is a set of evidences that are on the process, and that is probably what is being referred to. It is unfortunate that the process is archived, but, perhaps this note might enable to reopen the inquest and the resumption of the investigation until the truth is established, the material truth, the complete truth, for Justice to be made. G.A. - No, it was an excellent relation, of cooperation, we often had lunch and dinner together, we had various meetings, so there was already friendship between colleagues. It was people who were involved in an investigation, there wasn't any tension as it was stated. G.A. - They can reveal who was the person that carried the child on that night on its way to the beach. According to an Irish couple statement, with an alleged 80% certainty, it was Gerald McCann himself. That could be the confirmation of that Irish couple's statement. G.A. - We believe that, yes. In fact, the McCann couple themselves, said, a few months ago, that they also searched for them; that they don't exist, someone else later stated that they don't exist. It's possible that the site who has divulged the cable might also be able to release those images. That would be interesting. G.A. - Well, probably because they are a secret of state somewhere... In fact, the whole investigation was a state secret in England. I remind you that there is documentation in that sense, referring that it is a state secret. We do not understand why it is considered as a state secret. In question is the disappearance, and the likely death of a child, and we still fail to understand why is that considered as state secrecy. P.M. - You have spoken before on the «political will», do you consider that there was a connivance of the British government with the McCann couple, knowing that the London authorities, and at least we now have that certainty, were indeed aware of the evidence uncovered by the police of their own country. What I want to ask you, in your opinion, in the scope of this document, is, if we can understand a little bit better the manner in which the McCanns left the country? G.A. - I apologize for stating the obvious, but they have left the country by airplane. And they were well received back in England. What we became increasingly aware was the political influence, of the intervention of the British prime minister at the time, Gordon Brown, of the conversations that he allegedly had we our own prime minister, in October, at the Lisbon Summit - if they indeed spoke on the subject or not, we weren't there to listen, some say they did others say they didn't; but a fact remains, and this was the result: there was a point that the British police officers working on the case had to sign a document as if they belonged to the secret services, requesting their confidentiality so they wouldn't speak about the case. Definitely something strange, not usual under other circumstances. Thus, from then on, and with other elements, that would be too lengthy for us to be here now detailing - remains no doubt that a political intervention, practically, archived the case. G.A. - The case went to the Portuguese General Attorney's Office, who published a statement saying that they had not find any indicia in the process...something that we find very strange. I recall that on the decision made by the Appellate Court, on October 19, of this year, which lifted the banning of the book that I've authored, 'Maddie, The Truth of The Lie', suggests that with the indicia that exists in the process, the opinion of the Public Ministry to archive the case could be another if the prosecutors were different - that means that something exists there [on the process]. I have no doubts that the magistrates, the appellate judges have read the process. G.A. - This matter has evolved, step by step, we cannot use this document as a flag, the knowledge of this note as a victory - let's put it in this way, it does not mean an immediate reopening of the case. However, I do believe that we are walking towards that goal, that finally the reconstitution of the facts may take place with the couple and with their friends, if they so wish, and if they are willing to return to Portugal. P.M. - You spoke of «victory», do you believe that this will change the perception that people have about the Maddie case? G.A. - The perception that I have, as far as the perception of people go, is that the Judiciary Police has worked, the Judiciary Police was able to reach some conclusions, important conclusions. That the process needs to go on, the investigation has to continue, and, as we have previously spoken here today, the process was archived for political reasons - that is the perception that people have. WikiLeaks has drilled through the USA's security system and has been publishing thousands of documents. One of them tells us what we already knew. The English ambassador reported that the English police had obtained evidence that Maddie's parents were involved in the death and disappearance of their daughter and that, for State reasons, that fact had been simply hidden from the Portuguese Justice. The couple's spokesman did not deny it. He merely stated that this issue was history. It didn't matter. When one is protected, such arrogance is permitted. Nonetheless, it is also true that protection by the powerful serves the powerful but will never be able to hide the truth, which, as we all know, always surfaces. And the truth is here again. Vigorous, without mercy, without pity for those who have always wanted to see a moral end to this story. From pitiful journalists who have refused to publish any other thesis apart from the truth that was sold and produced before time: the little girl was abducted, end of. Everything else was silliness and bad taste by the Portuguese police and those who have always understood how the famous adbuction was impossible. And that silliness was accepted by the Public Ministry, that ordered the process to be shelved, The investigation interrupted, the couple under protection, the formal, judicial truth hacked off without scruples. WikiLeaks tells us that the whole thing was well secured by the English government after all, and who knows where the evidence is being kept. The truth is that the criminal investigation cannot live on prejudice. To demonstrate the nexus of causality between the victim and the perpetrator is, under any circumstance, the sole motivation that presides over police work. There is no politics, there is no private interest or of any other kind that can override the search for the truth. This works in Portugal. And every year parents kill children and children kill parents. Nevertheless, they are not protected by any specific government, neither in Portugal nor in any other country. Therefore, they are subject to the superior decision of the courts. That was not the case of the unfortunate English child, whose disappearance remains unsolved due to the protection that surrounded her dear parents, who, by the way, have always been treated in an excellent way in Portugal, regardless of the suspicions that hung over them. From the media campaigns until the English provocation that insulted Portugal in the name of the parents' dignity. How much did that campaign cost? Maybe there is another WikiLeaks cable that informs us about the dirt concerning this subject, that we still have to learn.